Star Petal Table Topper Measures 36" Diameter. It will be perfect for any coffee or end table. What a beautiful way to accentuate your table center piece. This lovely table topper will take approximately 6+ hours to complete. It is strip fabric friendly. 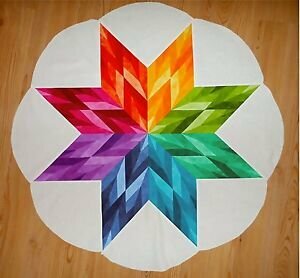 This pattern uses the Creative Grids 8" 45 Degree Diamond Dimensions Ruler.